Picture yourself at the world-famous SeaWorld®, where amazing rides and animal attractions keep you wide-eyed at every turn. 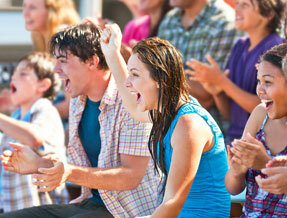 Discover the splash-tastic fun of Aquatica, SeaWorld’s Waterpark®. Explore the wild lands of Busch Gardens® where super coasters and the world’s most incredible animals await. Or upgrade to the Discovery Cove Ultimate Package to unwind in the tropical oasis of Discovery Cove® where you can swim with dolphins or laze the day away on white sandy shores. You soar, you fly, you gasp, you giggle. Meet amazing marine animals and jump into their world on sensational rides, attractions and shows at SeaWorld. Feel as though you’re thrashing through the sea as you chase your prey on Mako®, Orlando’s fastest, tallest, longest AND only hypercoaster. Embark on a deep-sea mission on Kraken® Unleashed, a floorless coaster inspired by legendary beasts of the past. Manta® taunts you with a head-first, face-down nosedive with the full force of riding the high seas like a giant ray. Marvel at a turtles-eye-view of the ocean on TurtleTrek®, the world’s only 3D-360° experience. Waddle through the icy South Pole and feel what it’s like to be a penguin in Antarctica: Empire of the Penguin®. Be awestruck by the infectious energy of our killer whale encounter, or belly laugh at Clyde and Seamore’s Sea Lion High®. Let an ocean of fun and adventure wash over you at SeaWorld. Hop onboard for a rapid ride of your life! Journey down the lost jungle river and discover twists at every turn... plus there's a 40-foot drop! Wooooooop!! You trek, you plunge, you chase, you spin. Come within a whisker of some of the world’s rarest animals, feel their energy and inhabit their world on Florida’s wildest rides at Busch Gardens. Explorers beware! An ancient Egyptian curse has been awakened in the park; can you keep your head as family coaster Cobra's Curse® spins you out of control? Sprint across the Serengeti Plain® at the speed of the fastest animal on Earth on Cheetah Hunt®. 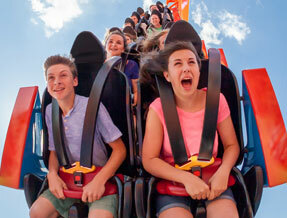 Freefall in a heart-racing face-down descent as you stalk your prey from 335-feet on Falcon’s Fury®. There’s nothing tame about Jungala®, the family-friendly habitat where you can come face-to-face with orangutans or zip line through the treetops. Or, embark on a journey on the Serengeti Safari®, where you'll observe rhinos, zebra, antelope and many more African animals. Get as close to the wild as you dare at Busch Gardens. OPENING 2019: Tigris® Get ready to take on Tigris, Florida’s tallest launch coaster, in spring 2019. Catapult through looping twists, daring drops, a 150-foot skyward surge – all at more than 60 miles per hour, on a coaster designed to mimic the awe-inspiring agility of the world’s most powerful cat – the tiger. You splash, you scream, you float, you laze. 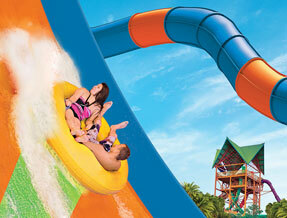 Welcome to Aquatica, a splashy watery park full of super-sized slides, speedy splashdowns and sandy shores. Enjoy three times the thrills on latest ride Ray Rush™ with water jets, a huge sphere and an open air slide shaped like the wings of a manta ray. Take the plunge on Ihu’s Breakaway Falls® which pits riders face-to-face waiting for the floor to drop. Rip through the tunnels and turns of Taumata Racer®, the competitive mat race that’s staggeringly steep and deliriously head-first. Wanna-be skaters can take on Omaka Rocka’s™ half pipe tunnels, defying gravity as they climb the walls like a pro. Or why not take some time to relax? Simply drift along the soothing streams of Loggerhead Lane™, unwind on a beautiful beach and let the waves wash over you. 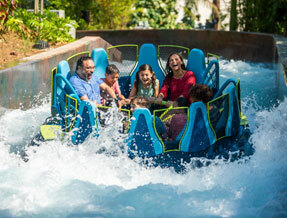 Come play side-by-side with the sea at Aquatica. This thrilling new two person raft ride will deliver a splashtastic, high-adrenaline, weightless adventure. You snorkel, you snooze, you swim, you smile. Explore a lush landscape of rocky lagoons, waterfalls and pristine sandy beaches at Discovery Cove. You’ll feel as if you’ve stumbled upon an undiscovered tropical island. Snorkel through The Grand Reef®, a vast underwater world teeming with thousands of colourful fish and graceful rays. Wade and float in the sparkling clear springs of Freshwater Oasis®, and gaze at the otters and marmosets at play. Let colourful birds land on your shoulders and eat out of your hands in the Explorer’s Aviary. Can you imagine realising your biggest dream? Step into Dolphin Lagoon™ and watch it come to life as you’re greeted by a beautiful bottlenose dolphin. Expect a bucket list experience like no other. Tranquillity and exhilaration await you at Discovery Cove. 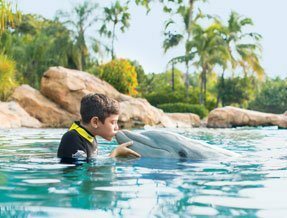 Enjoy an all-inclusive day at Discovery Cove, 14 days unlimited admission to SeaWorld, Aquatica, SeaWorld’s Waterpark and Busch Gardens PLUS free unlimited parking with the Discovery Cove Ultimate Package. Get up close and explore a once-in-a-lifetime underwater world with animal interactions at The Grand Reef’s innovative undersea walking tour. Don your dive helmet and you’ll feel right at home under the sea. The best way to experience SeaWorld Parks is with a multi-park ticket. Take advantage of this special offer and enjoy 3 parks for the price of 2! The 3 for 2 Ticket offers 14 days access to SeaWorld, Aquatica & Busch Gardens PLUS unlimited FREE parking. Or you could upgrade to the Discovery Cove Ultimate Package and enjoy an all-inclusive day at Discovery Cove, 14 days access to SeaWorld, Aquatica & Busch Gardens PLUS unlimited FREE parking! Only available to purchase in the UK & Ireland! The 3 for 2 Ticket offers 14 days access to SeaWorld, Aquatica and Busch Gardens PLUS free unlimited parking. Enjoy all the fun of the 3 for 2 Ticket PLUS an all-inclusive day at Discovery Cove. This package includes breakfast and lunch as well as drinks (including alcoholic beverages for over 21s) as well as snorkelling equipment, wetsuits, towels and lockers. If the Dolphin Swim Package is selected this will also include an amazing opportunity to swim and interact with a friendly bottlenose dolphin. This innovative experience takes you on an underwater walking tour of our Grand Reef while wearing a dive helmet and brings you face to face with schools of fish and velvety rays. This is one not to be missed! 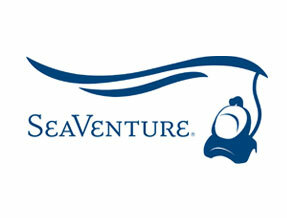 Take your adventure to the next level by adding a SeaWorld Parks Extra to your booking. For every purchase, SeaWorld Parks & Entertainment donate $2 to specifically help UK wildlife charities, researchers and biologists make even more of a difference, both at home and overseas. Skip the regular queue lines as many times as you want… so that your adventure can begin straight away! Quick Queue Unlimited is also available at Busch Gardens. Pay just once and enjoy a day of great food and drink. 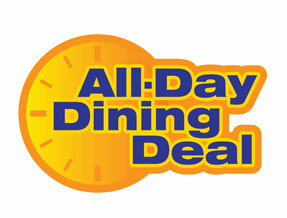 Enjoy one entrée, one side or one dessert and one regular size non-alcoholic beverage every hour. Available at Busch Gardens, SeaWorld or Aquatica. Book the best (and driest!) seats in the house for our incredible shows - One Ocean, Clyde & Seamore’s Sea Lion High, Dolphin Days and Pets Ahoy! The above prices are guidelines only and are correct at the time of publishing. Subject to availability. Other travel dates are available, supplements may apply. All tickets provide unlimited admission for 14 consecutive days from first use, with the exception of Discovery Cove which is a one day experience. Guests must be at least 6 years of age to swim with the dolphins at Discovery Cove. Guests aged 6-12 must be accompanied by a paying adult who is also participating in the dolphin swim experience. 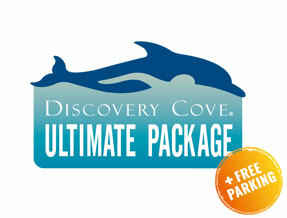 Discovery Cove guests aged 3-5 must purchase the non-dolphin swim package. Free bus transportation is available to Busch Gardens on the Busch Gardens Shuttle Express. 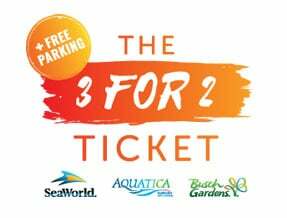 Unlimited free parking at SeaWorld, Aquatica and Busch Gardens is only available when purchasing either the 3 for 2 Ticket or Discovery Cove Ultimate Package. Unlimited free parking is only valid for the duration of your ticket. This offer can be withdrawn or changed at any time. Children 0-2 years of age are free of charge. *Offer valid for new bookings only. Book and first visit must be by 31st December 2019. © 2018 SeaWorld Parks & Entertainment, Inc. All Rights Reserved.